This document is accurate and up to date! It was last reviewed by a lawyer in April 2019. A Residential Lease Agreement is used when a Landlord wishes to rent or lease property to a Tenant for residential and possibly home-based business purposes. For example, this form would be used to rent out an apartment or basement suite. This rental/lease will be governed by the laws of which nation? How many Landlords are there? Is the Landlord a corporation? How many Tenants are there? Is the Tenant a corporation? Do you wish to specify the number of bedrooms? How many bedrooms are there (e.g. 3)? Do you wish to specify the number of bathrooms? How many bathrooms are there (e.g. 2)? How many items do you wish to describe? Will the Tenant(s) have access to amenities? Will the Tenant(s) have access to parking? Do you wish to describe the parking location? E.g. "422 Elm Street" or "the lane behind the Premises"
What is the parking fee, per month (e.g. 20.00)? If you wish to allow the tenant to operate a home-based business on the premises, indicate your wishes in this section. Remember that the premises must be zoned for home-based business use. Will the Tenant be allowed to operate a home-based business? Will other occupants be allowed without the Landlord's written permission? Will pets be allowed in the housing? Will the Tenant(s) be allowed to smoke in the housing? Are there smokers in nearby units/residences? Do you know when you will be starting this lease? Is the date of occupancy the same as the start date? An inspection report details the condition of the premises at the beginning of the tenant's occupancy. If there is any damage to the premises, it is noted in the report so the landlord knows that the tenant should not be held responsible for this damage upon moving out. Is an inspection report required on move-in? Will the Landlord(s) be providing signing incentives? E.g. The Landlord shall waive the Tenant's first rent payment. When will the agreement end? You may wish for the tenant to provide a security deposit upon moving in. Should the tenant damage the premises, or leave some rent unpaid, appropriate deductions from the deposit will be made. The remainder of the deposit is usually refunded to the tenant upon moving out. Will the Tenant be paying a security deposit? How soon after tenancy ends will the deposit be returned? Do you wish to specify where the deposit will be sent after the Tenant moves out? Is parking included in the rent? Will the Tenant(s) be paying taxes directly to the Landlord(s)? Are these taxes included in the rent? Will the Tenant(s) be paying taxes directly to the government? Will the Tenant(s) be paying the condo fees? Will the fees be included in the rent? How often will the rent be paid? Does the cost of Rent include any utilities? E.g. The monthly rent will increase by $50.00 every year. How many days notice is required (e.g. 14 days)? Will a late fee be charged for late rent? How many days grace are there before late fees are charged (e.g. 5)? How will the late fee be calculated? How much will the Tenant(s) be charged for each N.S.F. Check (e.g. 30.00)? Will interest be charged on late rent? How much notice is required for the Landlord(s) to enter the property? Will the Landlord(s) be making improvements to the property? How many improvements do you wish to list? Will the Tenant be allowed to make improvements to the property? Will the Tenant(s) be responsible for any maintenance of the property? What will the Tenant(s) maintain? Will the Tenant(s) have to steam clean the carpet? Will the Tenant(s) be allowed to assign or sublet the lease? Can this lease be renewed? E.g. The Tenant may renew this lease provided he/she has not been late in paying any rent. Do you wish to add a military clause? Will a rerent levy be charged if the Tenant moves out within 6 months of moving in? Do you wish to add any additional clauses? How many additional clauses do you wish to add? This agreement will be signed in front of how many witnesses? We recommend the presence of one or more witnesses at the signing of this agreement. 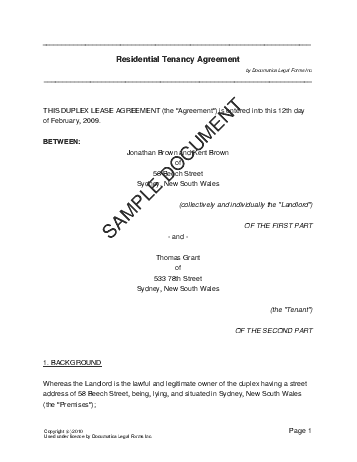 Do you know when you will be signing this lease? The sample documents below are provided for informational purposes only. They may NOT be legally valid or enforceable. We strongly recommend obtaining an attorney reviewed Residential Rental/Lease directly from us. Select a document above, and cut-and-paste the text into a word processor of your choice. Fill in the blanks, modify the wording and format appropriately. The parties choose the above stated addresses as their physical addresses for purposes of delivery of any notice, payment of any amount and at which legal proceedings may be instituted pertaining to this property rental agreement. Each of the parties will be entitled at any time by way of written notice to the other to change the information regarding their physical addresses. Such change will become effective on the 7th day after receipt by the other party of the notice. Any notice which the Landlord requires to give to the Tenant shall be deemed to have been validly given if sent by pre-paid registered letter to the Tenant at the Property or left by the Landlord or his Agent at such address, which notice shall be deemed to have been received 5 days after posting by registered post, or on the day the notice was delivered by hand. The lease shall be automatically renewed after the initial term on a month to month basis under the same conditions. After the initial period of the lease this property rental agreement may be cancelled by either the Landlord or the Tenant by giving one month written notice. For the purposes of this property rental agreement a month shall be construed to be a calendar month. The monthly rental for the premises for the initial period is an amount of _________ (in words: ______________________________________ ). The rental includes an amount payable for rates and taxes/levies in respect of the Premises to the local authority / body corporate / share block company / home owner's association concerned which will be payable by the Landlord. The said monthly rental is escalated annually at a rate of ________% ( _________________________ percent) of the monthly rental for the previous year. Tenant to pay a late payment charge of ________________________________________ if rent is not received within five days after the due date to cover collection fees and/or additional administration fees and Tenant to pay an amount of _____________________________________for each rent check returned for insufficient funds and thereafter pay rent by cash or cashier's check. claim payment of any arrear rental or any other monies due, be it compensation for damages to the premises, or damages arising out of breach of the agreement by the Tenant. In the event of the Tenant not vacating the property after cancellation of the agreement by leaving his property or possessions behind, the tenant shall be liable for the rental. The Tenant shall not be entitled to any reduction in rental while the Landlord does repairs to the property. In the case of a furnished unit, simply attach an Inventory to your free Lease Agreement and also have that signed and witnessed. It is important to issue the Tenant with a copy of the Rules or Code of Conduct of the Home Owner's Association or Body Corporate or other applicable legal entity pertaining to the Premises. This document will stipulate additional Terms and Conditions not covered in the free lease agreement. The lease agreement supplied here makes provision for acknowledgement of receipt in clause 9.15. To guarantee performance of your tenant under this free lease agreement, you may want to consider entering into an additional and separate guarantor agreement. Please refer to our Free Legal Forms page for a full list of our available free legal documents. Below are some random samples we have created with Documatica. Please note that these documents reflect a certain set of answers, and it is very likely that the document you require is different. Do not rely on the templates below - create your own customized Residential Rental/Lease with our webpage. For maximum legal protection, obtain a lawyer reviewed Residential Rental/Lease directly from us. Copyright © 2006-2019, Documatica Legal Forms, Inc. All Rights Reserved.